UtahPresents promotional image of Doug Varone and Dancers. UtahPresents programmed an evening of choreography by Doug Varone, held at the University of Utah’s Marriott Center for Dance. The performance featured members of Varone's company, Doug Varone and Dancers, Varone himself, special guest artists and former Varone company members Daniel Charon and Natalie Desch, members of Ririe-Woodbury Dance Company, and students from the University of Utah School of Dance. The multiple groups shared the performance cohesively. I would have loved to see even more interaction among the different groups, but I understand that they had limited time together to prepare for this show. The first work presented, “in the shelter of the fold,” consisted of five sections, which were held together thematically, and with similar music (intense ambient sounds with humming vocals) and lighting design (many-rayed light coming from one source, with darkness to contrast around it). ‘1. horizon,’ performed by the company, introduced a stiff movement style that continued through the next couple sections as well. The dancers created shapes and painted pictures together as a group, moving at varied speeds and with nice moments of stillness. My favorite moment of stillness involved a female dancer holding a male dancer up off of the ground. It was an interesting and aesthetically pleasing lift that demonstrated grace, strength, and coordination. But also, many female dancers are perfectly capable of lifting a male dancer, and yet we don’t see it choreographed that way very often, even in today’s more current landscape of female empowerment. I liked that it wasn’t supposed to be a big statement, just something that could happen naturally within a choreographic work. Looking at it in that light, it’s ironic that I wanted to dedicate a whole paragraph to the topic. ‘2. folded,’ performed by two dancers from the company, was not particularly noteworthy as far as any differences from the first section. It ended with the performers vigorously shaking their heads at the front of the stage, which I enjoyed. ‘3. 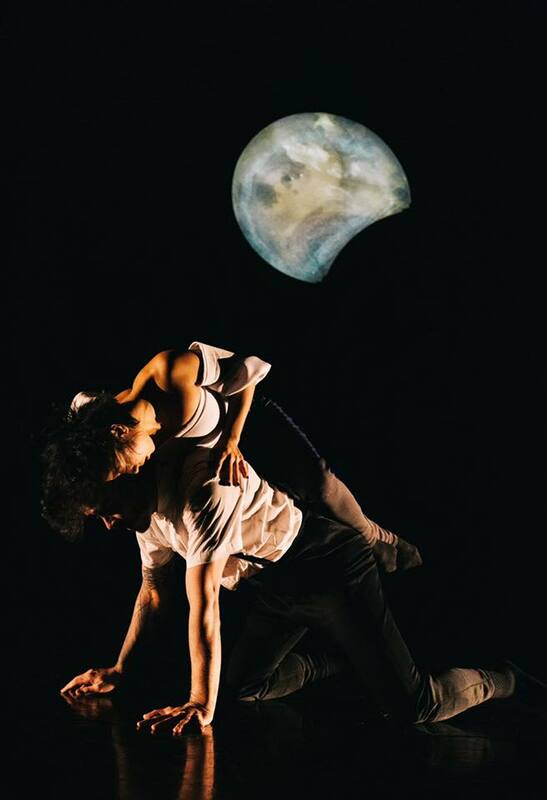 shelter,’ performed by three dancers from the company, portrayed continual negotiation of relationships, likely among two parents and their child. It was tense and poignant, and included some wonderfully executed, choreographic details of hand articulation. ‘4. mass,’ performed by students from the University of Utah School of Dance, was stylistically different from the previous sections, featuring more choreographed unity among the dancers, more fluid movements, and more use of physical flexibility. This contrasting piece was like a breath of fresh air. The dancers from ‘4. mass’ slowly crawled off the stage as ‘5. hope’ began. It was wonderful to integrate the two sections that likely could not have been rehearsed together very much due to time constraints. It was simple, but so effective, especially because of how well it fit the style. The crawling theme was also repeated toward the end of ‘5. hope,’ tying it together even more, and without feeling too repetitive. ‘5. hope’ was a solo by Hsiao-Jou Tang, who is, in my humble opinion, the very best choice for a solo feature of anyone who shared the stage that evening. Her seemingly natural grace and movement details made her stand out. After intermission, we saw “Strict Love,” which featured an off-putting combination of upbeat music and stiff, floppy movements. Eight dancers (a combination of performers from Ririe Woodbury and Doug Varone and Dancers) seemed stuck in their limited expressions (contrasting with the lively soundtrack) as they stayed in the same formation for a displeasing amount of time. This 1994 piece by Varone wasn’t my favorite, but it did provide a good contrast to other pieces within the show. After a pause, Doug Varone himself performed a self-choreographed piece titled “Nocturne.” The solo included a pleasing mix of larger dance movements, gestures, and wonderfully natural pedestrian moments. I loved Varone’s unique and charming style, especially his expressive hands and shoulders. Next came a piece performed by Daniel Charon and Natalie Desch, called “Short Story.” I disliked it, although I don’t think that its purpose was to be likable. The piece portrayed a tense relationship and power struggles between two people. I prefer for everyone to support each other, so this was not my cup of tea. However, it was a memorable and well-executed piece. Finally, “LUX,” a 2006 Varone piece, was performed by the company. “LUX” gave the audience a welcome abundance of big, energetic movement, including some playful barefoot tap moves, solos from my favorite dancer, Tang, and a strong ending. I very much appreciate the way that the evening of Varone’s choreography ended with a bang, so to speak.